Like a fox's brush set in line with the body and moderately long (to touch or nearly touch ground). Carried low when standing but may be lifted a little above body when moving, not curled over back. Strong, well-angulated and aligned with muscular thighs and second thighs, strong bone carried down to feet, legs short; when standing hocks vertical, viewed from side and rear. Round, tight rather large and well padded. All dewclaws to be removed. set fairly low on body line and reaching well below hock. Carried low when standing or moving slowly, streaming out parallel to ground when at a dead run, lifted when excited, but never curled over the back. High tail set is a serious fault. Well muscled and strong, but slightly less wide than shoulders. Hipbone (pelvis) slopes downward with the croup, forming a right angle with the femur at the hip socket. There should be moderate angulation at stifle and hock. Hocks well let down. Metatarsi perpendicular to the ground and parallel to each other. Dewclaws removed. Feet- point straight ahead and are slightly smaller and more oval than front. Toes arched. Pads well filled. Overall, the hindquarters must denote sufficient power to propel this low, relatively heavy herding dog efficiently over rough terrain. (3) An efficient ground covering gait when traveling long distances over varied terrain. It is historically unclear whether the CWC was used primarily for moving cattle and sheep only for short distances, or whether the CWC was occasionally used to move herds of cattle or flocks of sheep longer distances into the flatter pasturelands and markets of England. In either case, the CWC had to be a sound working animal capable of sudden energy bursts and longer, more energy efficient movement.-- All of this while still in a small, dwarfed body! This generalised approach to the job of a farm dog does not allow for a specialised structure (e.g. greyhound for speed at the gallop, or a German Shepherd Dog for fast moving trot.) 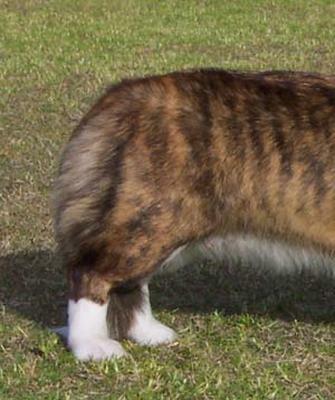 Instead the Cardigan Welsh Corgi structure requires a very careful balancing act between its three primary functions. It should also be remembered that the poor crofters of Wales could not afford to feed several dogs to do several different jobs and being a very good keeper, and being a very good keeper, (that is a dog who does very well on very little food) the Cardigan Welsh Corgi might also be called into service to retrieve small game birds, turn a spit, perform duties as an efficient ratter or other generalised farm work as the need arose. This requires a rear assembly which can provide a good push (drive) which is then transmitted through a strong loin and back. Thighs should be well muscled and of good breadth and strength, in shape reminding us of a really good ham. 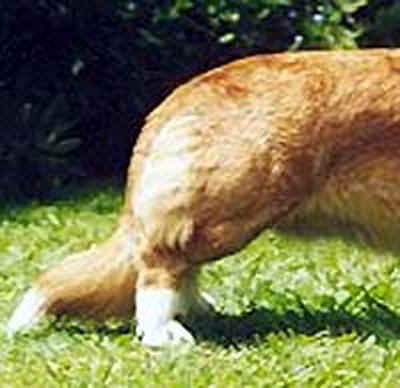 When compared to dogs with normal-length legs, the width of the thigh muscles is relatively greater in relation to the length of the same muscles. This feature of the muscling is probably a direct result of both the way the Cardigan works and the consequence of the Cardigan's dwarfism. The correct slight downward slope of the croup is an important feature of both breed type and function. It distinguishes the Cardigan from its cousin, the Pembroke. A flat, squared off croup or a croup dropping off too abruptly is incorrect, and represents a deviation from that balancing act as mentioned above. Dogs with very slight or no slope to their croups (i.e. flat croups) do not exhibit correct rear under-reach. 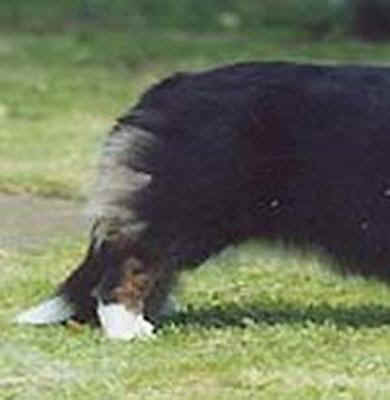 Dogs with too steep a croup (falling off) will not exhibit the correct rear extension follow-through and will often have hocks which are also too long, thus giving a lack of strength to the entire rear assembly. The pelvis, femur and fibula/tibia should all be of about equal length and set at an angle of about 90 degrees to each other. 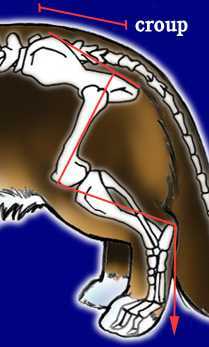 Well angulated and correctly muscled hindquarters allow for free and smooth action. Straight stifles will result in restricted movement. The hocks (rear pasterns) must be short and vertical when viewed from the side and parallel and not too close together when viewed from the rear. 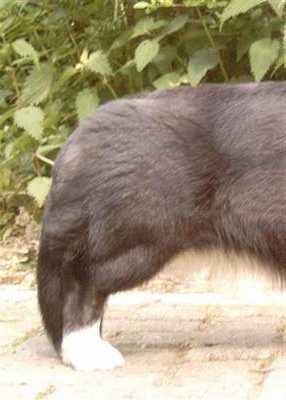 Any tendency towards cow hocks (hocks turned inwards) and barrel hocks (hocks turned outwards) is a serious fault. The UK standard requires "strong bone carried down to feet" and "round feet". Neither standard refers to the shape of the bone but it is generally accepted that the Cardigan is supposed to have round bone whereas the Pembroke is supposed to have oval bone. In general round feet go with round bone, and oval feet go with oval bone. The big round feet are a breed characteristic. The rear feet are slightly smaller and more oval than the front feet. 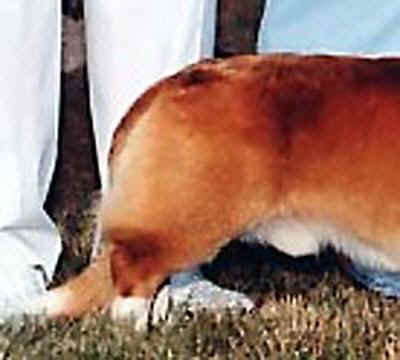 The feet of the Pembroke Corgi, both front and rear, have a more oval shape. 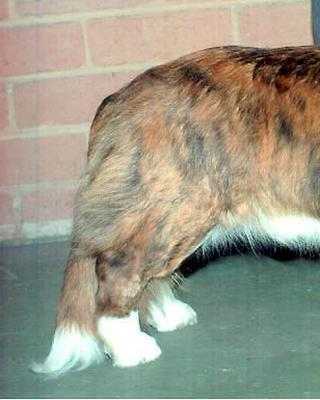 While the Cardigan Corgi standard asks for a round foot, it has been suggested that the Cardigan feet are actually a bit wider than long, which is why the paw would not leave a circular print but, provided the toes are short and well padded, it would leave a transverse oval. That is, a print which is a bit wider than long rather than the longitudinal oval of the Pembroke Corgi. Thin feet with long, flat toes, often with poor bone, and open feet with splayed toes are most unsightly and unsound for a working dog. Nails should always be kept short. Nails which are too long can change the shape of the foot. Both standards ask for the removal of all dew-claws. **NOTE: Some European countries no longer permit the removal of declaws for reasons of animal welfare. appendages which seldom bleed much due to having only a rudimentary blood supply connection to the rest of the leg. Hind dew claws are found higher up on the inside of the hind leg, below the tarsal joint. Unlike front dew claws hind dew claws are often not fully formed, and do not have proper joints so they hang loosely and are much more likely to get caught during exercise. On the occasions that double rear dew-claws do appear, one may be bone connected and one may not. In some breeds these very rudimentary, boneless appendages are called floating dewclaws. Sometimes the double dewclaws may be fused together. Lovely rear, nicely rounded off croup and correct tail set giving flowing line; good angulation; moderate to short hocks with good bone. Well coated hindquarter makes croup and tail set difficult to assess, but looks OK. Good angulation, short hocks with good bone.